You are not alone. Yes, I hate bulky wallets too. I remember the days when I had a bi-fold wallet that gradually became obese as I kept loading it up with more cards, more receipts and occasionally cash. Surprisingly, it never bothered me that much until more recently when I realized, why the heck am I carrying so much crap? Upon researching many different wallets, I’ve found that slim minimalist wallets are the way to go. There are plenty on the market but in this article, I’ll be reviewing the tan and black version of MVRIK’s ‘Nostalgia’ Slim Minimalist Wallet that I managed to pick from Amazon with a discount coupon. Unique slim minimalist design doesn’t feel bulky in any pocket even when full. Genuine top grain vintage cowhide leather looks, feels and smells great. It’s able to fit 6 to 9 cards, around 12 bills and some coins. 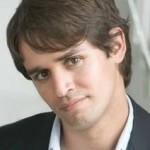 The right dimensions to holdother currencies such as European. A perfect fit for casual or formal use. Natural leather marks may be off-putting to some (I personally like it). Dimensions (inches) 4.5" x 3.1" x 0.47"
There are a few really cleverly designed wallets out there such as the ones from Bellroy, but the problem with some of them is that they’re not very functional. 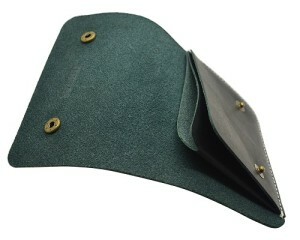 The quality bronze buttons keep the wallets contents secure, while the white stitching inside and out adds character. Fortunately, you can add the Nostalgia wallet to the list of functional minimalist wallets out there. Although it’s classed as a bi-fold wallet, it’s actually just as slim as a ‘no fold’ wallet because the cover which is secured by two buttons, is just there to protect the contents. On the front, there’s the MVRIK logo in between the two buttons. The logo’s not small, but it’s not too big either. The back is plain with a white stitching on the outer edge of the wallet, which gives it a nice complimentary touch of style. This style of stitching is also seen underneath the cover. 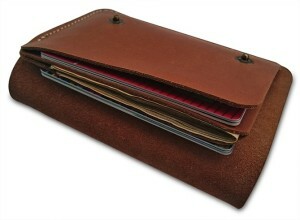 A main concern with a lot of slim wallets is the stitching, whether it holds up or not. Only time will tell, but for the meantime, there doesn’t appear to be any loose threads or bad quality with the stitching on this model. Another thing that I really love about this slim wallet is its top-grain cowhide leather. It has a vintage look and feel to it, and it even shows natural leather marks that gives it more character. Just a word of note, I’ve got the tan version which is beautiful, but the Nostalgia wallet also comes in a black version too if you prefer a more formal look instead. Why? Because there are only 3 compartments, which doesn’t sound like a lot but it works well with the Nostalgia wallet. Any more than that, then it will no longer be a minimalist wallet. The two outer compartments is where you’d put your cards. It can comfortably hold 3 cards in each side. You can actually fit another one or two in either side, but you probably wouldn’t want to stretch it beyond its limits. In the centre is a clever closed off compartment where you separate your cash bills and coins. I easily fit 12 bills and several coins in there. If you don’t carry coins or even bills, then you can fit another 3 cards in this pocket. That’s the beauty of this wallet. It’s so simple yet so versatile. 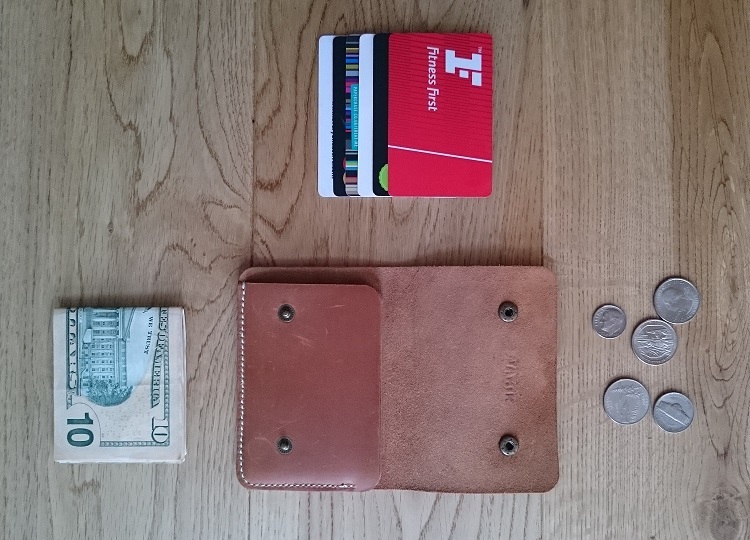 Functionality…it’s a problem that plagues plenty of minimalist wallets. The desire to create something clever sometimes ends up sacrificing an essential element of the wallet in the first place. 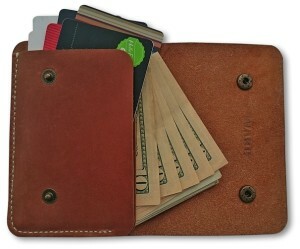 This genuine leather minimalist wallet is cleverly constructed to hold cards, cash and coins while still being slim. The Nostalgia wallet by MVRIK doesn’t have much of a functionality problem. When the cover is opened, it’s pretty easy to put in or take out cards and cash. If you decide to put coins in the middle compartment, then it’s a little difficult to take them out especially if it’s stuffed with notes or more cards. I don’t often carry coins, so this doesn’t concern me much. The wide open top is designed to allow you to have quick and easy access to your cards. While it’s easy to slip a finger in and slide out the most outside card on either side, it’s not so easy to reach the inner cards of each side. The solution is just to place your everyday cards on the outside or just open the cover and take out any card. I had no trouble putting cards back in via the open top slot however. The MVRIK Nostalgia Slim Minimalist wallet is now added among my favorites and I can see myself using this quite frequently. 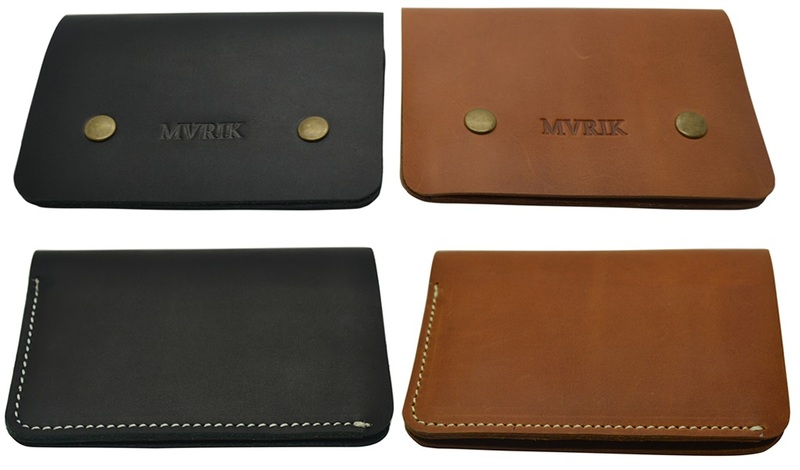 It may even replace my permanent wallet which happens to be the ‘Neat’ wallet by MVRIK. When I have it full, it’s still really compact and I hardly even notice it’s in my pocket. It also doesn’t give a noticeable bulk in your front pocket either. I like the vintage leather, which feels and smells like really high quality leather. I’ve actually found myself unconsciously picking it up and sniffing it before, as weird as it may sound. Ultimately, the best thing of all to me is how easy it is to use. This is largely in thanks to its buttoned up front cover opening that opens up so wide that you can pick and choose what you need at an instant. I’m glad I got this gem by MVRIK, and if you’re still on the fence about buying this, I’d urge you to go for it.